Mary and Ingrid are sisters, born and brought up in China, now resident in the US. Mary is the older of the two; seemingly a devoted wife, mother, churchgoer, and with a well paid job, she is, however, tormented by adultery, her grudge toward her parents, and her despair at work. Her estranged sister Ingrid, meanwhile, has never settled to anything; she prefers her bohemian friends’ Latin culture to her own, and is haunted by her college boyfriend’s tragic death. When their widowed mother travels to the US for the first time, they can’t avoid a family get-together. Amid all it stirs up, it becomes clear that the uneasy relationship between the sisters has its roots deeper than either has ever acknowledged – and extends to their parents and their homeland. 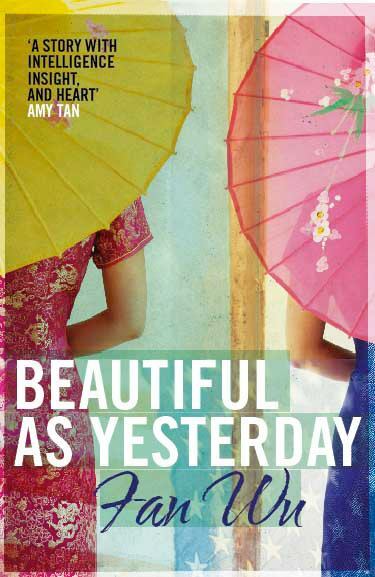 Stretching from mid-century China to the US at the turn of the millennium, Beautiful As Yesterday explores issues of identity, of family and friendship, love and loss. Written in beautifully crafted prose, this is a penetrating exploration of what it means to belong, and the impact of history and memories on one’s life. Fan Wu is an exciting storyteller with an original take on the disarray of family history and American culture, and, ultimately, how we manage to define ourselves. Beautiful As Yesterday is a story with intelligence, insight, and heart. A book for the new millennium. Told half way between here and there, Beautiful as Yesterday holds a mirror to America as much as it tells us about contemporary China...Fan Wu tells tales of modern Chinese women without mythologizing or romanticizing their lives. Her stories are foreign and familiar all at once, her writing beautiful and spirited. A delicate and brilliant novel on the arguments, triumphs, loves and differences of a Chinese family in America. This novel explores the consequences of trapping one family between two nations. Placidly paced, and eschewing claims to grandeur, the story traces familial and cultural values as they transfer between generations and geography.